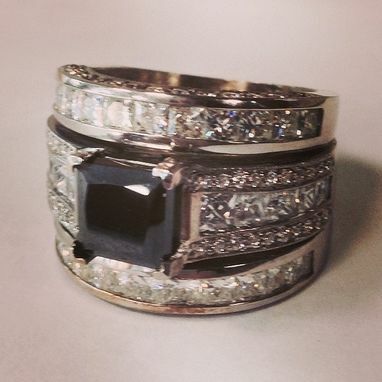 This project consisted of three rows of diamonds in a set of three bands. The ring center is a black diamond 2 carat which is offset by pave set round diamonds, and princess cut diamonds which are channel set. The set is finished in 14kt white gold. Perfect ring for engagement and wedding set.